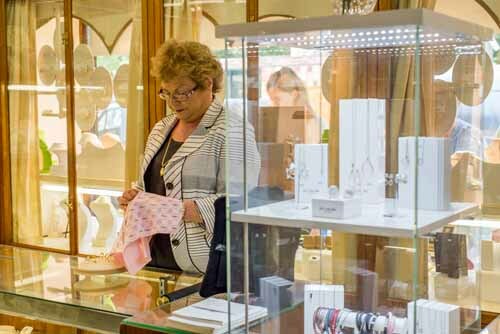 We carry a great selection of Women’s and Men’s Jewellery to suit all tastes and budgets. Our gold jewellery collection is sourced from all over the world. From our stunning diamond and precious gemstone pieces to our Italian classically designed necklets and bracelets. To compliment these special pieces, we also have several ranges of branded jewellery in sterling silver. January: Usually dark red in colour, Garnets actually sweep across all colours except blue. Also given on the 12th Wedding Anniversary. February: Amethyst is a stone of violet or purple colour and is said to bring luck. Also given on the 17th Wedding Anniversary. March: Aquamarine has become very popular in jewellery making. Also given on the 19th Wedding Anniversary. April: The hardest substance known to man – and the most treasured of all gemstones, Diamonds make wonderful gifts at any stage of life. Also given on the 10th and 60th Wedding Anniversary. May: One of the rarest of all precious gems, in ancient times Emeralds were treasured for their beauty and for their power of healing. Also given on the 20th Wedding Anniversary. June: The most precious of all organic gemstones, Pearls are made by molluscs when a fine grain of sand becomes trapped within the oyster shell. Also given on the 5th and 30th Wedding Anniversaries. July: In various shades of red, Rubies have always enchanted people. Also given on the 40th Wedding Anniversary. August: Peridot is an unusual gem, in shades of yellow, green and brown. September Although it appears in many different colours, the most abundant colour of Sapphire is blue. Also given on the 15th Wedding Anniversary. October:In the Orient, Opals – a rare, white, grey, blue, green and orange gem are given as a token of loyalty and hope. Also given on the 6th Wedding Anniversary. November: Topaz is highly valued as a gem and may be colourless, yellow, green, blue or red. December: Turquoise has been valued for its ornamental properties since ancient times and has been found in jewellery recovered from old Egyptian tombs.